The number of medical tourists from China is rising because of cheaper costs and better services overseas. Talking about her recent trip to Thailand, Wang Jingxian said it was "really worthy as well as comfortable and happy". The 35-year-old Beijing white-collar worker traveled to Bangkok in October for skin laser surgery to rejuvenate her appearance at Bumrungrad International Hospital, one of the world's top 10 multiple-specialty medical centers targeting patients globally. "I appreciated the environment and services of the hospital. And it's affordable, even cheaper than the private medical institutes in Beijing," Wang said. It has become a trend in China for middle-income and affluent people to travel abroad for medical care services. An online survey conducted by Ipsos, a France-based market research company, shows 74 percent of Chinese respondents said they would look outside the country for cheaper healthcare services. According to the poll covering 24 nations, 59 percent of respondents in the Asia-Pacific region would consider traveling to another country to receive medical or dental care if the costs were significantly lower than in his or her country. In Latin America the figure was 64 percent. In the Middle East and Africa it was 63 percent. The findings shed light on medical tourism, an increasingly popular worldwide phenomenon that is becoming a formalized industry in many countries. Chinese people's interests in overseas medical tourism might be attributed to limited and competitive medical resources in the domestic market, the high-quality and considerable number of services in well-known foreign private hospitals, relatively low costs overseas and the added value of travel, according to Hu Bo, chairman of Ciming Health Checkup Management Group Co Ltd.
Wang said she spent around $1,000 for surgery and hospitalization in Bangkok. With flight tickets and some incidental fees, the 10-day trip cost her $2,000. "The hospital's lobby was like a five-star hotel offering concierge-style services. The medical practitioners were patient and nice. The food was really fantastic. All of these things were impressive," she said. Hu said that most Chinese middle-class health travelers are eyeing Southeast Asian nations, such as Thailand and Malaysia, while some of the richer ones are going to developed markets such as Switzerland for anti-aging therapy using sheep placentas and Germany for general health checkups and health improvement. Malaysia is attracting Chinese people with a six-month visa brought into play last year. 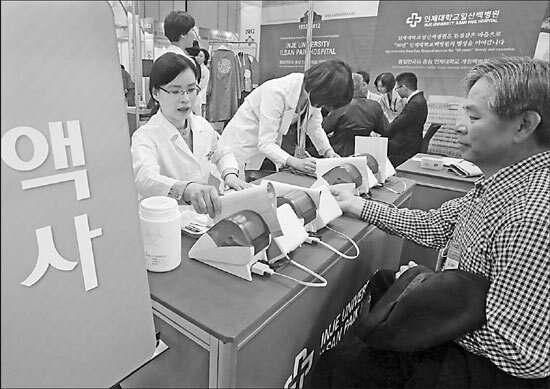 Chinese medical tourists to the nation rose 48 percent year-on-year in 2011. South Korea is well known for its plastic surgery services. A source in the South Korean embassy in China said it issued 1.07 million visas to Chinese medical travelers last year, up 386 percent year-on-year. At the same time, there were 2.05 million visits by Chinese people to the East Asian country, an annual increase of 23.6 percent.